The Gainesville business caters to those who might not have the time to shop for food but who still enjoy preparing nutritious, home-cooked meals. Laura dePaz Cabrera is a busy woman. She balances her career as an attorney with a personal life that includes her husband and their 5-year-old son. She also is the lead female vocalist for the Gainesville-based, Latin-fusion band Tropix. No wonder that planning family meals is usually not at the top of her daily to-do list. That’s why she happily welcomes Chef Ami into her kitchen. Each week, the Gainesville company delivers step-by-step recipe cards and all the fresh ingredients needed to prepare three main courses and side dishes in 30 minutes or less. “This is a completely new concept for this area, but people really seem to like it,” said Matt Dickhaus, who launched Chef Ami with his wife, Johana, in 2014. One week customers might enjoy sweet and spicy pork chops with pineapple-fried rice, baked caprice ravioli and Mediterranean chicken with parmesan orzo pilaf. 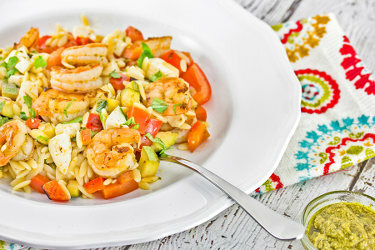 The next week the meals might include mouthwatering Tex-Max lasagna, goat-cheese and sun-dried tomato stuffed chicken and shrimp arrabbiata. Chef Ami has more than 80 recipes in its rotating menu. Dickhaus chooses three of those recipes each week. Once customers place their orders online, Dickhaus purchases fresh produce, meat and seafood items from local growers and markets, according to how many meals his customers have ordered in advance. Chef Ami’s suppliers include Hawthorne’s Frog Song Organics, Alachua’s Swallowtail Farm, Gainesville’s Rainbow Star Farm and Starke’s Cognito Farms. On Mondays, Dickhaus and his crew portion and package the ingredients at their commercial kitchen in southwest Gainesville. 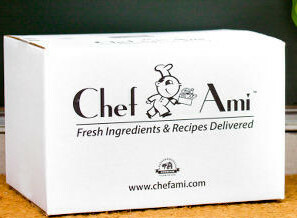 On Tuesdays, all the ingredients for those three meals, including detailed recipe cards, are delivered to doorsteps in reusable, refrigerated boxes with the distinctive Chef Ami logo designed by Matt’s father, Dan. Customers decide when each meal is prepared and enjoyed during the week. Properly stored, the food stays fresh for seven days. Dickhaus got the idea for the recipe and food-delivery service from a company many of his co-workers used when he and Johana lived in Germany. Dickhaus, a Gainesville native and GHS grad, thought his hometown would be the ideal place to start such a business in this country. Customers have the option of ordering three meals a week for two, four or six people. Pricing ranges from $65 a week (six meals) to $179 a week (18 meals). Broken down, each meal costs between $10 and $11—less than the price of a main course at most restaurants. 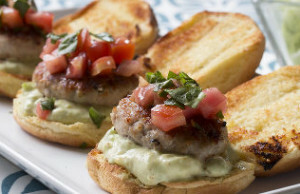 DePaz Cabrera said following the step-by-step recipe cards is “super easy.” She likes the fact the cards also include instructions for plating the food. She struggled, however, when asked to name her favorite Chef Ami meal. Of course, satisfying customers is Chef Ami’s objective. Although Dickhaus has a bachelor’s degree in marketing, he consults with retired master French chef Michel Maloiseau for culinary guidance. Dickhaus prepares each recipe multiple times himself before adding it to the Chef Ami menu. Another goal of the company is to reduce food waste. Dickhaus wanted a service that delivered food in meal-sized portions. That’s one reason Chef Ami makes a concerted effort to give back to the community through its Feeding Florida program. The company donates its extra food to Gainesville Harvest and also works with Jacksonville-based Second Harvest to feed children. For each meal Chef Ami customers purchase, a meal (or equivalent dollar value) is donated to Second Harvest to aid the fight against child hunger in Florida. Dickhaus said he witnessed poverty firsthand in Colombia, where he once worked for a travel agency. 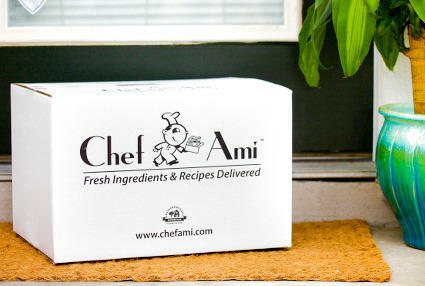 DePaz Cabrera started using Chef Ami on the recommendation of friends and by taking advantage of a Groupon offer. Now, not only does her family enjoy the recipes delivered to her doorstep, she’s proud to help a local company that gives back to the community. 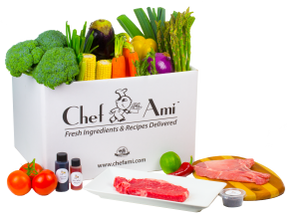 Visit Chef Ami on the web. 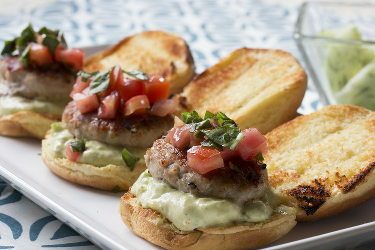 Follow Chef Ami on Facebook.